My broad research interests are population genomics and evolutionary biology of fishes. During the last years, I was studying the genetic bases of convergent evolution in adaptive traits (e.g. "hypertrohied lips") in cichlids. I also investigated about population genomic differentiation and colonization pathways in African cichlids. Actually, I have moved back to Oviedo University (Spain) to start my own research group where we are carrying out different research lines focusing on adaptive and conservation genomics in commercially exploited fish species (e.g. hakes, salmons, eels). Nov 2017 – present: Assistant Professor, University of Oviedo (Spain). Apr 2010 – Mar 2017: Postdoctoral position in Axel Meyer's Group, University of Konstanz (Germany). Deutsche Forschungsgemeinschaft (DFG, 2013-2016) & Alexander von Humboldt Research Fellowship for Postdoctoral Researchers (2011-2013). ​Sep 2006 – Sep 2009: PhD in Biological Sciences at University of Oviedo (Spain). Thesis title: Genetic structure of American hake populations and traceability of commercial fish products. Sep 2004 – Sep 2006: M.Sc. in Biological Sciences at University of Oviedo (Spain). Thesis title: Genetic drift associated with stocking in Salmo salar. Mar 1998 – Sep 2003: Licentiate in Biology at National University of the Patagonia San Juan Bosco (Argentina). Thesis title: Development of biomarkers in littoral ecosystems: standarization of micronucleus test in Mytilidae family. 2017: FICYT Clarin-Cofund Marie Curie Postdoctoral Fellowship (Declined). 2014-2015: Research grant Young Scholar Fund (YSF, 83964814). 2013-2016: Research grant Deutsche Forschungsgemeinschaft (DFG, MA 6144/1-1). 2011-2013: Alexander von Humboldt Research Fellowship for Postdoctoral Researchers. 2010: Independent Research Start-Up Grant (IRSG). Zukunftskolleg. University of Konstanz. 2008-2009: PhD Extraordinary Award. University of Oviedo (Spain). 2004-2007: PhD Grant supported by Agencia Española de Cooperación Internacional, AECI (Spanish Government). 2006: First prize in "VI Congress on Marine Sciences". (Oral Post grade communication) Puerto Madryn (Argentina). 2006: Travel grant from the Scandinavian Institute in Statistical Genetics (University of Aarhus, Denmark). 2004: PhD Grant. High level scholarship programme addressed to Latin America, ALBAN (Declined). 46. C.F. Kratochwil, Y. Liang, J. Gerwin, J.M. Woltering, S. Urban, F. Henning, G. Machado-Schiaffino, C.D. Hulsey & A. Meyer (2018) Agouti-related peptide 2 drives convergent evolution of stripe patterns across cichlid fish radiations. Science 362, 457-460. 45. A.F. Kautt, G. Machado-Schiaffino & A. Meyer (2018) Lessons from a natural experiment: Allopatric morphological divergence and sympatric diversification in the Midas cichlid species complex are largely influenced by ecology in a deterministic way. Evolution Letters 2-4, 323-340. 44. J.L. Horreo, A.M. Griffiths, G. Machado-Schiaffino, J.R. Stevens & E. Garcia-Vazquez (2018) Northern areas as refugia for temperate species under current climate warming: Atlantic salmon (Salmo salar L.) as a model in Northern Europe. Journal of Fish Biology (https://doi.org/10.1111/jfb.13825). 43. J. Gilbey et al. (2018) A microsatellite baseline for genetic stock identification of European Atlantic salmon (Salmo salar L.). ICES Journal of Marine Science 75(2), 662-674. 42. C.D. Hulsey, G. Machado-Schiaffino, L. Keicher, D. Ellis-Soto, F. Henning & A. Meyer (2017) The integrated genomic architecture and evolution of dental divergence in East African cichlid fishes (Haplochromis chilotes x H. nyererei). G3: genes, genomes and genetics 7(9), 3195-3202. 41. J. Torres-Dowdall, J. Golcher-Benavides, G. Machado-Schiaffino & A. Meyer (2017) The role of rare morph advantage and conspicuousness in the stable gold-dark polymorphism of Midas cichlid fishes. Journal of Animal Ecology 86(5), 1044-1053. 40. G. Machado-Schiaffino, A.F. Kautt, J. Torres-Dowdall, L. Baumgarten, F. Henning & A. Meyer (2017) Incipient speciation driven by hypertrophied lips in Midas cichlids fish?. Molecular Ecology 26, 2348-2362. 39. F. Henning*, G. Machado-Schiaffino*, L. Baumgarten & A. Meyer (2017) Genetic dissection of adaptive form and function in rapidly-speciating cichlid fishes. Evolution 71(5), 1297-1312. 38. J.L. Horreo, G. Machado-Schiaffino & E. Garcia-Vazquez (2017) Forensic assignment to geographic origin, a useful tool in seafood fraud control. Forensic Science International 272, 37-40. 37. A.F. Kautt, G. Machado-Schiaffino & A. Meyer (2016) Multispecies outcomes of sympatric speciation after admixture with the source population in two radiations of Nicaraguan crater lake cichlids. Plos Genetics 12(6): e1006157. 36. A.F. Kautt*, G. Machado-Schiaffino*, J. Torres-Dowdall & A. Meyer (2016) Incipient sympatric speciation in Midas cichlid fish from the youngest and one of the smallest crater lakes in Nicaragua due to differential use of the benthic and limnetic habitats? Ecology and Evolution 6, 5342-5357. 35. G.D. Kavembe, A.F. Kautt, G. Machado-Schiaffino* & A. Meyer* (2016) Eco-morphological differentiation in Lake Magadi tilapia, an extremophile cichlid fish living in hot, alkaline and hypersaline lakes in East Africa. Molecular Ecology 25, 1610-1625. 34. G. Machado-Schiaffino, A.F. Kautt, H. Kusche & A. Meyer (2015) Parallel evolution in Ugandan crater lakes: repeated evolution of limnetic body shapes in haplochromine cichlid fish. BMC Evolutionary Biology 15:9. 33. L. Baumgarten, G. Machado-Schiaffino, F. Henning & A. Meyer (2015) What big lips are good for: on the adaptive function of repeatedly evolved hypertrophied lips of cichlid fishes. Biological Journal of the Linnean Society 115, 448-455. 32. G.D. Kavembe, P. Franchini, I. Irisarri, G. Machado-Schiaffino & A. Meyer (2015) Genomics of adaptation to multiple concurrent stresses: insights from comparative transcriptomics of a cichlid fish from one of Earth's most extreme environments, the hypersaline Soda Lake Magadi in Kenya, East Africa. Journal of Molecular Evolution 81, 90-109. 31. G. Machado-Schiaffino*, F. Henning* & A. Meyer (2014) Species-specific differences in adaptive phenotypic plasticity in an ecologically relevant trophic trait: hypertrophic lips in Midas cichlid fishes. Evolution 68, 2086-2091. 30. J. Torres-Dowdall, G. Machado-Schiaffino, A.F. Kautt, H. Kusche & A. Meyer (2014) Differential predation on colour morphs of Nicaraguan Crater lake Midas cichlid fish: implications for the maintenance of gold-normal polymorphism. Biological Journal of the Linnean Society 112, 123-131. 29. G.D. Kavember, G. Machado-Schiaffino & A. Meyer (2014) Pronounced genetic differentiation of small, isolated and fragmented tilapia populations inhabiting the Magadi Soda Lake in Kenya. Hydrobiologia 739, 55-71. 28. L. MIralles, G. Machado-Schiaffino & E. Garcia-Vazquez (2014) Genetic markers reveal a gradient of hybridization between cape hakes (Merluccius capensis and Merluccius paradoxus) in their sympatric geographic distribution. Journal of Sea Research 86, 69-75. 27. J.L. Horreo, G. Machado-Schiaffino, & A.M. Griffiths, D. Bright, J.R. Stevens & E. Garcia-Vazquez (2014) Long-term effects of stock transfers across species boundaries: synergistic introgression of allochthonous genomes in salmonids. Journal of Fish Biology 85, 292-306. 26. V. Crego-Prieto, J. Arrojo-Fernandez, A. Prado, G. Machado-Schiaffino, J.I. Izquierdo, A. Roca & E. Garcia-Vazquez (2014) Cytological and population genetic changes in Northwestern Iberian mussels after the Prestige oil spill. Estuaries and Coasts 37, 995-1003. 25. T. Manousaki, P.M. Hull, H. Kusche, G. Machado-Schiaffino, P. Franchini, C. Harrod, K.R. Elmer & A. Meyer (2013) Parsing parallel evolution: ecological divergence and differential gene expression in the adaptive radiations of thick-lipped Midas cichlid fishes from Nicaragua. Molecular Ecology 22, 650-669. 24. A.K. Finnegan*, A.M. Griffiths*, R.A. King*, G. Machado-Schiaffino, J-P Porcher, E. Garcia-Vazquez, D. Bright & J.R. Stevens (2013) Use of multiple markers demonstrates a cryptic western refugium and postglacial colonisation routes of Atlantic salmon (Salmo salar L.) in northwest Europe. Heredity 111, 34-43. 23. J.L. Horreo, J. de la Hoz, I. Gonzalez-Pola, G. Machado-Schiaffino & E. Garcia-Vazquez (2012) Ecological and economic cost of supportive breeding: Atlantic salmon as a case study. Aquaculture 356-357, 1-6. 21. G. Machado-Schiaffino & E. Garcia-Vazquez (2011) Population structure of long tailed hake Macruronus magellanicus in the Pacific and Atlantic oceans: implications for fisheries management. Fisheries Research 111, 164-169. 20. A.M. Griffiths, J.S. Ellis, D. Clifton-Dey, G. Machado-Schiaffino, D. Bright, E. Garcia-Vazquez & J.R. Stevens (2011) Restoration versus recolonisation; the origin of Atlantic salmon (Salmo salar) currently in the River Thames. Biologial Conservation 144, 2733-2738. 19. J.L. Horreo, G. Machado-Schiaffino, A.M. Griffiths, D. Bright, J.R. Stevens & E. Garcia-Vazquez (2011) Atlantic salmon at risk: apparent rapid declines in effective population size in southern European populations. Transactions of the American Fisheries Society 140, 605-610. 18. J.L. Horreo, J. De La Hoz, G. Machado-Schiaffino, I.G. Pola & E. Garcia-Vazquez (2011) Restoration and enhancement of Atlantic salmon populations: what we have learned from North Iberian rivers. Knowledge and Management of Aquatic Ecosystems 402, 23. 17. J.S. Ellis, J. Gilbey, C. Cherbonnel, S. Consuegra, J. Coughlan, J.E. Cresswell, T. Cross, W. Crozier, E. Dillane, D. Ensing, C. Garcia de Leaniz, E. Garcia-Vazquez, A.M. Griffiths, K. Hindar, S. Hjorleifsdottir, D. Knox, G. Machado-Schiaffino, P. McGinnity, D. Meldrup, E.E. Nielsen, C. Primer, J.P. Vaha, E. Verspoor, V. Wennevik & J.R. Stevens (2011) Microsatellite standardization and genotyping error in a large multi-partner research programme for conservation of Atlantic salmon (Salmo salar L.). Genetica 139, 353-367. 16. 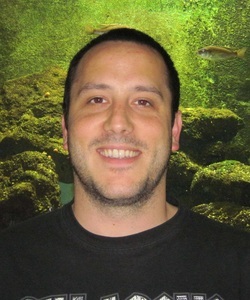 G. Machado-Schiaffino, F. Juanes & E. Garcia-Vazquez (2011) Identifying unique populations in long-dispersal marine species: Gulfs as priority conservation areas. Biological Conservation 144, 330-338. 15. E. Garcia-Vazquez, J. Perez, J.L. Martinez, A. Pardinas, B. Lopez, N. Karaiskou, M. Casa, G. Machado-Schiaffino & A. Triantafyllidis (2011) High level of mislabelling in Spanish and Greek hake markets suggests fraudulent introduction of African species. Journal of Agricultural and Food Chemistry 59, 475-480. 14. J.L. Horreo, G. Machado-Schiaffino, F. Ayllon, A.M. Griffiths, D. Bright, J.R. Stevens & E. Garcia-Vazquez (2011) Impact of climate change and human-mediated introgression on southern European Atlantic salmon populations. Global Change Biology 17, 1778-1787. 13. G. Machado-Schiaffino, F. Juanes & E. Garcia-Vazquez (2010) Introgressive hybridization in North American hakes after secondary contact. Molecular Phylogenetics and Evolution 55, 552-558. 12. A.M. Griffiths, G. Machado-Schiaffino, E. Dillane, J. Coughlan, P. Minting, S. Toms, W. Roche, P. Gargan, D. Bright, E. Garcia-Vazquez & J.R. Stevens (2010) Genetic stock identification of Atlantic salmon (Salmo salar) populations in the southern part of the European range. BMC Genetics 11(1), 31. 11. G. Machado-Schiaffino, D. Campo & E. Garcia-Vazquez (2009) Strong genetic differentiation of the Austral hake (Merluccius australis) across the species range. Molecular Phylogenetics and Evolution 53, 351-356. 10. E. Garcia-Vazquez, J.L. Horreo, D. Campo, G. Machado-Schiaffino, I. Bista, A. Triantafyllidis & F. Juanes (2009) Mislabeling of Two Commercial North American Hake Species Suggests Underreported Exploitation of Offshore Hake. Transactions of the American Fisheries Society 138, 790-796. 9. G. Machado-Schiaffino & E. Garcia-Vazquez (2009) Isolation and characterization of microsatellite loci in Merluccius australis and cross-species amplification. Molecular Ecology Resources 9, 585-587. 8. D. Campo, G. Machado-Schiaffino, J.L. Horreo & E. Garcia-Vazquez (2009) Molecular Organization and Evolution of 5S rDNA in the Genus Merluccius and Their Phylogenetic Implications. Journal of Molecular Evolution 68, 208-216. 7. G. Machado-Schiaffino, L.O. Bala & E. Garcia-Vazquez (2009) Recovery of normal cytogenetic records in mussels after cessation of pollutant effluents in Puerto Madryn (Patagonia, Argentina). Estuaries and Coasts 32 (4), 813-818. 6. D. Campo, A. Alvarado, G. Machado-Schiaffino, I. Naji, R. Pelaez, F. Quiros, O. Rodriguez, A.G.F. Castillo & E. Garcia-Vazquez (2009) Inquiry-based learning of molecular phylogenetics II: the phylogeny of Camelidae. Journal of Biological Education 48 (2), 78-80. 5. J.L. Horreo, G. Machado-Schiaffino, A. Griffiths, D. Bright, J. Stevens & E. Garcia-Vazquez (2008) Identification of differential broodstock contribution affecting genetic variability in hatchery stocks of Atlantic salmon (Salmo salar). Aquaculture 280, 89-93. 4. G. Machado-Schiaffino, J.L. Martinez & E. Garcia-Vazquez (2008) Detection of Mislabeling in Hake Seafood Employing mtSNPs-Based Methodology with Identification of Eleven Hake Species of the Genus Merluccius. Journal of Agricultural and Food Chemistry 56 (13), 5091-5095. 3. D. Campo, G. Machado-Schiaffino, J. Perez & E. Garcia-Vazquez (2007) Phylogeny of the genus Merluccius based on mitochondrial and nuclea genes. Gene 406(1-2), 171-179. 2. G. Machado-Schiaffino, E. Dopico & E. Garcia-Vazquez (2007) Genetic variation losses in Atlantic salmon stocks created for supportive breeding. Aquaculture 264, 59-65. 1. J.I. Izquierdo, G. Machado, F. Ayllon, V.L. D’Amico, L.O. Bala, E. Vallarino, R. Elías & E. Garcia-Vazquez (2003) Assessing urban pollution in coastal ecosystems: the micronucleus test in the mussel Mytilus edulis. Ecotoxicology and Environmental Safety 55, 24-29. G. Machado-Schiaffino, A.F. Kautt, J. Torres-Dowdall, F. Henning, C. Kratochwil & A. Meyer (2018) The genetic basis and architecture of adaptive traits in cichlid fishes. XXII Seminar of Population Genetics and Evolution. Aranjuez (Spain). G. Machado-Schiaffino, A.F. Kautt, J. Torres-Dowdall, F. Henning & A. Meyer (2018) Incipient sympatric speciation driven by hypertrophied lips in Nicaraguan cichlid Fishes. 6th Meeting of the Spanish Society for Evolutionary Biology. Palma de Mallora (Spain). G. Machado-Schiaffino, F. Henning, L. Baumgarten & A. Meyer (2015) Genetic dissection of hypertrophied lips and foraging performance in cichlid fishes. Cichlid Science 2015. Graz (Austria). G. Machado-Schiaffino & A. Meyer (2012) Phylogeography and colonization events of Ugandan crater lake cichlid fish. 105 Annual meeting of the German Zoological Society. Konstanz (Germany). G. Machado-Schiaffino, F. Juanes & E. Garcia-Vazquez (2009) Tracing hybridization patterns in overlapping distribution areas of North American Merluccius species. International Conference on Evolutionary Ecology of Fishes Diversification, Adaptation and Speciation. Berlin (Germany). G. Machado-Schiaffino, D. Campo & E. Garcia-Vazquez (2009) Strong genetic differentiation of the Southern hake (Merluccius australis) across the species range. II International Symposium in Marine Sciences. Vigo (Spain). G. Machado-Schiaffino, J.L. Horreo-Escaldon, A. Griffiths, D. Bright, J. Stevens & E. Garcia-Vazquez (2007) Examining the loss of genetic variation in Atlantic salmon stocks created for supportive breeding. ICES Annual Science Conference. Helsinki (Finland).